Manual measurement, size there will be a slight deviation, please understand. If you have any question about the product,please be free to contact us. We will reply email as soon as possible,all the message will be replied in 24 hour. Please be understanding and patient,we will try our best to give you a satisfactory reply. If you are satisfied with our service,could you please give us a positive feedback? We will very appreciate your support and understanding. 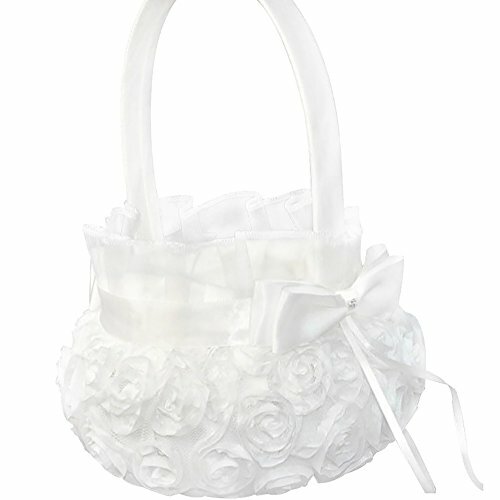 Wedding Flower girl basket is a must have decoration for your wedding ceremony,it will create the romantic atmosphere that you have been looking for. It is not just a decoration for your wedding,it was said to be a sign of good fortune,an emblem of love. Good handcrafts, specifically designed for wedding, graduation, banquet and other special events. Can be used to hold petals, can also be hold candy as a decoration placed on the table. With a good quality of packaging, you do not have to worry it will defomred during the transport. If you have any questions about this product by Lothver, contact us by completing and submitting the form below. If you are looking for a specif part number, please include it with your message.